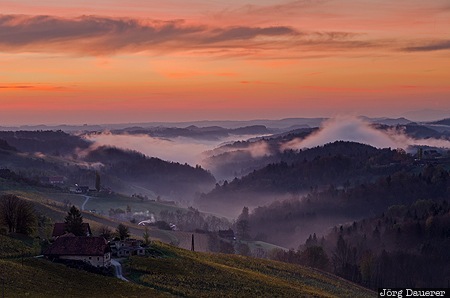 A colourful sunrise sky above the vineyards, tree covered hills and foggy valleys near Sulztal an der Weinstraße. Sulztal an der Weinstraße is in Styria (Steiermark), Austria. This photo was taken in the morning of a sunny day in November of 2013. This photo is in the Photo Calendar "Alps". This photo was taken with a digital camera.